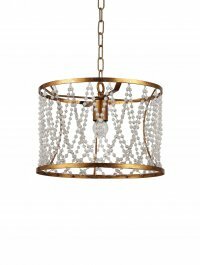 Suku Drum with Beads [CL2630] : Wholesale Lamps, Shades & Bulbs | AHS Lighting Wholesaler, Value priced accent, floor & table lamps with matching shades! This small chandelier packs a lot of punch. The sparkling beads of the Suku Drum will light up the area.